DFW Finishers is a service industry business serving Holly Springs, Apex, Fuquay-Varina, Cary, Raleigh, Durham, Morrisville, Garner, NC and the surrounding Triangle areas. We specialize in interior and exterior painting, and wood door refinishing. 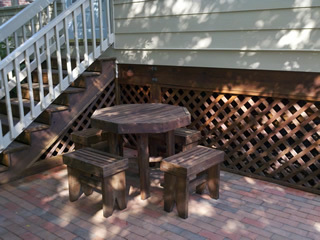 We also specialize in deck staining and fence staining, cleaning, and restoration. We offer professional furniture refinishing and painting as well. DFW Finishers also does pressure washing and carpentry wood rot repairs. We welcome both residential and commercial projects. Other services are available upon request. The owner, James McCary, grew up as a painter learning about the painting industry by working part-time as a kid in his father’s painting business. As a young adult, he professionalized his painting skills in a painting apprenticeship and by working full-time for over 10 years in his dad’s business. After working as a painter for many years, 7 years were spent in full-time vocational ministry. DFW Finishers was started out of a passion for painting combined with other professional skills such as wood restoration, deck staining and cleaning, and door refinishing. Being dependable, on time, honest, and fair are important to us as a company. You can entrust your project to us and have the peace of mind that comes from knowing you’ve made the right choice. We appreciate any opportunity given us to serve you as our customer. DFW Finishers of Holly Springs, North Carolina are: an Experienced wood deck restoration company including deck staining, deck cleaning, fence staining, and fence cleaning; a Professional painting company with interior painters, and exterior home painters; and Experts at wood door refinishing including front doors, and entry doors in the Raleigh, NC area. We service the areas of Apex, Cary, Fuquay-Varina, Raleigh, Holly Springs, Garner, Durham, and Morrisville.